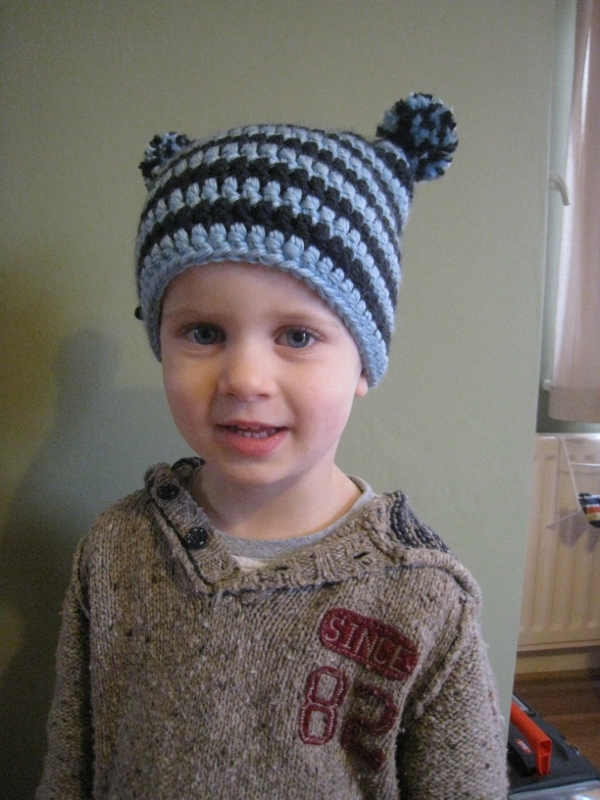 This has to be one of the simplest hats that I've made for Sam yet... it's just a rectangle shape with pom poms added to the top corners. To make it up was so easy (the hardest part was getting it the right size) that I'm slightly ashamed that it's taken me over a month to finish! I started out with a foundation chain the width I wanted the finished hat, then I worked double crochet into the back loops of the chain, continuing crocheting round through the front loops of the chain and finishing the first row with a slip stitch to join. Next I joined the second colour and did a row with that (still double crochet) and after that changed colour every row. I continued working in rows (carrying the second colour at the inside so no need to rejoin the yarn) until the hat was the depth I wanted. Very cute, Jess. These hats are so quick and easy to whip up. I used a similar design for my owl hat. Easily customizable. Such a sweet hat! I still can't get the knack of carrying a second colour over, I'm pretty sure I'm missing something obvious! 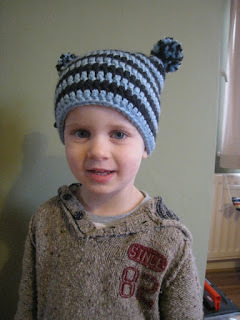 Hope Sam is nice and snug in his new hat, Emily would look adorable in a matching one!